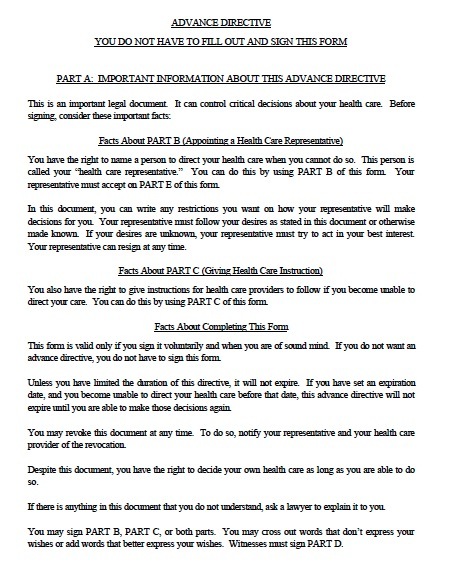 Advance directives are instructions that state which medical treatments you want to receive in the event you cannot state them yourself because of incompetence. Oregon allows a patient to authorize in advance that he or she would prefer to die naturally if the patient suffers from a terminal condition that would result in death a short time after removing life support. Two adults must witness the signing of the directive, but the patient’s spouse, relatives, physicians, agent, or healthcare or residential staff may not act as witnesses. You can also appoint someone as your healthcare representative to make decisions regarding your medical treatment. You can limit this authority by providing special instructions about what decisions your representative cannot make. To revoke a power of attorney, simply write a document stating that you revoke the previous power of attorney.